AfriForum CEO Kallie Kriel said Bonakele Pakisi, ‘the only eyewitness… admitted to lying when testifying’ that he had seen the duo killing Moshoeu. 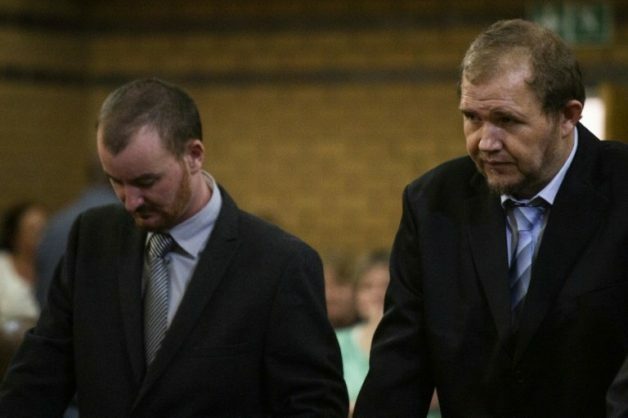 Civil rights group AfriForum has said it would help convicted murderers Pieter Doorewaard and Phillip Schutte to appeal their sentences, which were handed down today at the North West High Court. Doorewaard was sentenced to 18 years in prison and Schutte to 23 years for the 2017 murder of teenager Matlhomola Moshoeu. The men were found to have pushed the 16-year-old off a moving bakkie after accusing him of stealing sunflowers from the farm at which they were employed. AfriForum CEO Kallie Kriel said via an e-mailed statement tonight that the organisation would help with the appeal as Bonakele Pakisi, “the only eyewitness in the murder case, admitted to lying in court when testifying that he had seen Doorewaard and Schutte killing Moshoeu”. AfriForum would fund the appeal costs to allow advocate Barry Roux, senior counsel, to take on the case. Advocate Gerrie Nel and his team at AfriForum’s private prosecution unit would also provide support in investigating the case, said Kriel. The application would be brought within 14 days. “The investigative team of AfriForum’s private prosecution unit has already obtained affidavits from four different people. These affidavits point to Pakisi confessing to them about lying in court and that his confession was recorded,” said Kriel. He said that apart from helping Doorewaard and Schutte, AfriForum wanted to ensure that Pakisi was prosecuted criminally for having committed perjury. It was important that those who “spread lies to create racial tension and falsely [labelled] innocent people as racists be brought to book”, said Kriel. “Just like Doorewaard and Schutte’s lives were destroyed by lies, we recently saw in Schweizer-Reneke how racist troublemakers disrupted the life of Elana Barkhuizen, a competent teacher, with lies and misrepresentations. The time has come to make an example of liars and racist troublemakers,” said Kriel.